The country’s first commercial wind power park to be opened next week. Sri Lanka has harnessed the full potential of hydro power and needs to focus on wind as an alternate source of renewable energy. 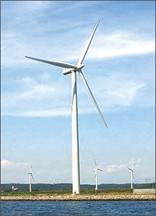 There are many wind sites in the North and North Eastern parts of Sri Lanka that could be developed for wind power generation. The national grid is able to take in 10 percent of its energy from renewable energy, Senok Group Financial Director, Pancherine Dias told Daily News Business. Senok is the first commercial wind power park to be opened next week. It is located in the southern part of Kalpitiya in the Puttalam district. The total investment of the project is US$21 million. Senok has invested 55 percent of this. The World Bank has funded the rest. The total capacity of the project is 30 megawatts. It is projected to be completed in three phases. Each phase will supply 10 megawatts to the national grid. Senok was involved in developing wind energy in Sri Lanka for the last 10 years. The company came up with the idea of setting up the wind power park due to a corporate objective of diversification. “There is much scope to develop 500 megawatts in the next five years in Sri Lanka. Within the next five to six years wind energy will be a sustainable industry in the country. The country is heading towards a new era. It is timely for the country to explore sources of alternative energy as it is a vital theme for the entire world,” Dias said. The wind plant is equipped with eight wind turbine generators. It has created jobs for around 40 employees. Wind power is a cost effective and environmental friendly source of energy. Although the capital investment is high the running cost is much less compared to hydropower generation. Wind power generation is also an environmental friendly source of energy as it is considered as a clear source of energy which is cost free. Senok Resource Management Associates Director Sunith Fernando said they need more technical expertise and assistance from countries such as Denmark and India. The country also needs concessionary funds and concessionary taxes for these types of projects, as capital investment is comparatively high. “It is important that the country has taken a timely decision in adapting to novel alternative energies. It is a key topic in the country in seeking cost effective and environmental friendly energy sources,” Fernando said. 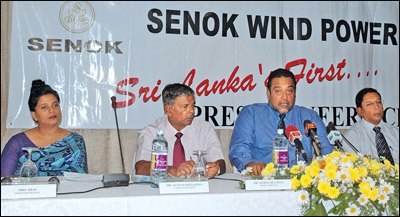 Senok Project Consultant O. J. S. Perera said wind is a natural source and it is limited for a certain season. 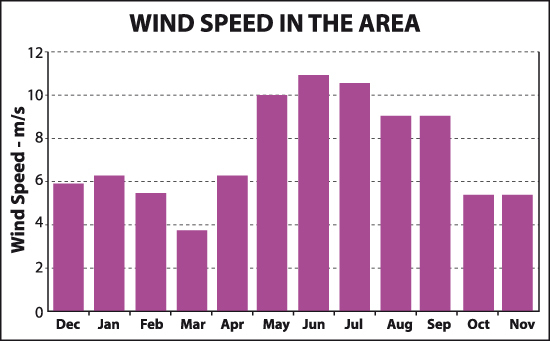 The company has studied and calculated the strength of the wind in different seasons. “Southwesterly winds are much stronger than the northeasterly winds,” Perera said. “However, in terms of the wind resource potential, the mean annual wind speed in the area varies from 7.0 - 7.5 m/s at 50m above ground level. Therefore, this wind power park will provide high and low power according to the strength of the winds,” he said. Senok expects to commence phase two construction by the end this year.